Original Wraparound Cover art by Glenn Chadbourne - SIGNED by the artist! Only 500 Signed Glenn Chadbourne Covered Copies Available! This trade hardcover release features a NEW COVER PAINTING and 14 NEW interior illustrations. 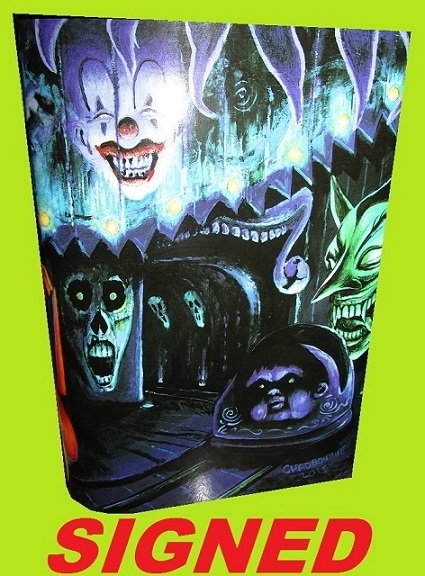 INCLUDES a SECOND COVER of Original Artwork by Glenn Chadbourne and Signed by the artist! Glenn Chadbourne has a special place in his noir-fiction heart for JOYLAND and he is currently working on a special full-color wraparound cover for this first US printing hard cover. This cover is signed and numbered to 500 copies by the artist. (all remarque customers will receive the same number in their series). Limited / Signed / Numbered Original Dust Jacket Art EXCLUSIVE by Glenn Chadbourne! First Printing Hard Cover Guaranteed! Sealed in an acid-free book cover and then sealed again for complete archival protection! 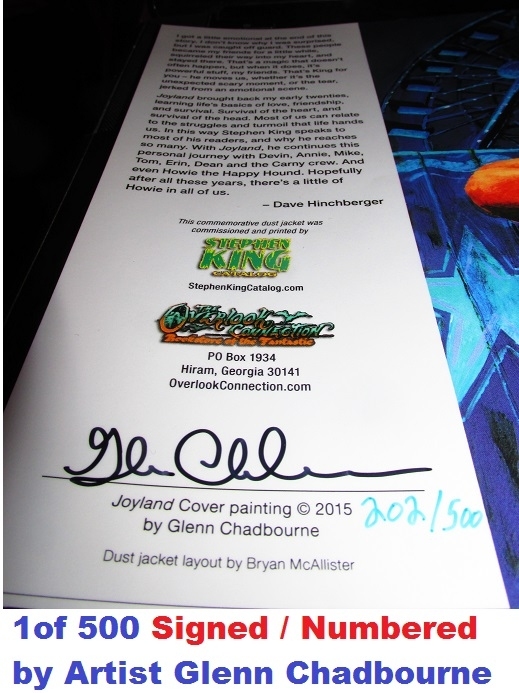 You can also purchase a Glenn Chadbourne Remarqued personally drawn edition also listed here at Stephen King Catalog. OVERVIEW: Set in a small-town North Carolina amusement park in 1973, JOYLAND tells the story of the summer in which college student Devin Jones comes to work as a carny and confronts the legacy of a vicious murder, the fate of a dying child, and the ways both will change his life forever. Stephen King commented, "I love crime, I love mysteries, and I love ghosts. That combo made Hard Case Crime the perfect venue for this book, which is one of my favorites. I also loved the paperbacks I grew up with as a kid, and for that reason, we’re going to hold off on e-publishing this one for the time being. Joyland will be coming out in paperback, and folks who want to read it will have to buy the actual book." "Joyland is a breathtaking, beautiful, heartbreaking book," said Charles Ardai, Edgar- and Shamus Award-winning editor of Hard Case Crime. "It’s a whodunit, it’s a carny novel, it’s a story about growing up and growing old, and about those who don’t get to do either because death comes for them before their time. Even the most hardboiled readers will find themselves moved. When I finished it, I sent a note saying, ‘Goddamn it, Steve, you made me cry.’ "
JOYLAND will feature new painted cover art by Glen Orbik as pictured here. 2015 Hard Case Hard Cover. Sealed in an acid-free book cover and then again in plastic for complete archival protection. Journals of Eleanor Druse GLOW IN THE DARK! 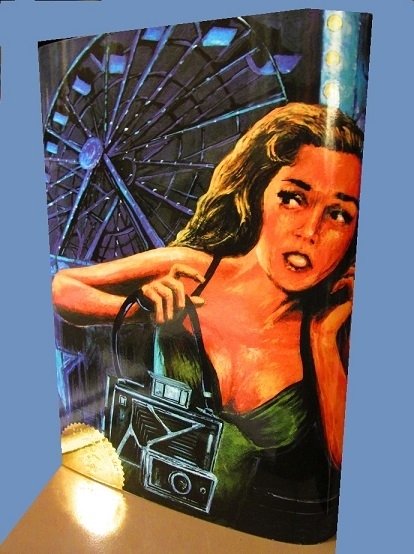 Lawnmower Man Portfolio is AMAZING! Mr. Mercedes Cover Art Now IN!